Get ready for the biggest First Saturday of the year with “Fire in Ice” on Saturday, February 2! 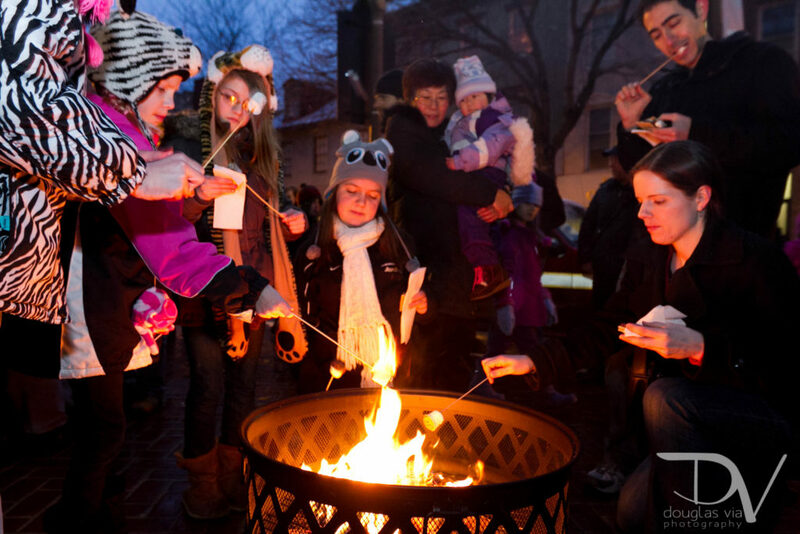 Bring the whole family out to admire more than 110 dazzling ice sculptures that will be lining the streets of Downtown Frederick, warm yourself over the flames of outdoor fire pits, hit up the amphitheater for a family-friendly Ice Bar by day, and to see jaw-dropping fire performers later in the night, and so much more! Find a complete lineup of events at downtownfrederick.org/february-first-saturday. Beginning at 12PM (noon) on Saturday, February 2 all parking garages will be available for a $5 flat rate. Bring $5 cash for quick and easy service, though credit cards are also accepted. Take note of the road closure from 2-9PM, which will block S Market St from All Saints St to Patrick St, and from Patrick St to Church St to vehicular traffic. The Carroll Creek Public Parking Garage will be still be fully accessible by entering and exiting from Patrick Street and the Church Street Public Parking Garage will still be fully accessible from Church St.
Download a copy of our February First Saturday Parking & Road Closure Map here or visit www.parkfrederick.org for more info on finding the best parking in Downtown Frederick. If you want to avoid downtown driving and parking all together, take advantage of the free shuttle that will be making runs between TownePlace Suites by Marriott (5050 Westview Dr.) and Downtown Frederick from 2-4PM and again from 6-8PM. The shuttle is provided by Plamondon Hospitality Partners and On the Town Limousines. More info here. Once you’re ready to start moving around Downtown Frederick, keep an eye open for the free Downtown Trolley. The trolley runs every 15 minutes from 3-9PM and has five convenient stops throughout downtown. It’s completely free! Just hop on and ride. Download a trolley route map here. Kick off your First Saturday festivities by visiting Ice Bar on the Creek located at the Carroll Creek Amphitheater, open from 1-5PM. All ages are welcome and admission is free, though make sure you’re 21+ with valid ID if you want to drink! All drinks cost $5 each, cash and credit card accepted. 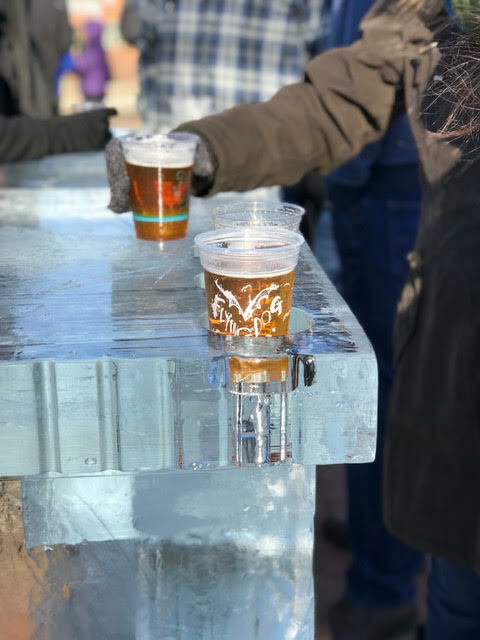 This year’s Ice Bar features food trucks by Mayta’s Peruvian Cuisine & Boxcar Burgers and drinks by Flying Dog Brewery, Brewer’s Alley, Olde Mother Brewing Co., Idiom Brewing Co., House Cat Brewing, Rockwell Brewery and Spin the Bottle Wine Company, with support from FoodPRO. Sidle up by one of our cozy fire pits, but remember to dress for the weather! Ice Bar on the Creek is completely outdoors and the bar is literally made of ice. If you’re looking for something a little sweeter, watch out for the S’mores Roasting or Hot Cocoa Stations, which open at 4PM and will stay in business until supplies run out. You can find these treats at 244 N Market St, 228 N Market St, 43 S Market St, 50 Carroll Creek Way, 134 N East St, 15 E Patrick St, 200 E Patrick St, 118 N Market St, 200 N Market St, and 119 E Patrick St.
You’ll also want to keep watch for one of our special Ice Game Stations, which include an ice bean bag toss at 200 E Patrick St and two Ice Thrones at La Paz Mexican Restaurant and Everedy Square & Shab Row’s Land of Ice and Fire. And, as the sun starts to set, visit Brewer’s Alley to watch a Live Ice Carving Demonstration from 5-8PM. And of course, the pièce de résistance of “Fire in Ice” are the ice sculptures and fire performances that dazzle guests year after year. This year the streets and sidewalks will be lined with more than 110 ice sculptures – more sculptures than ever before!! 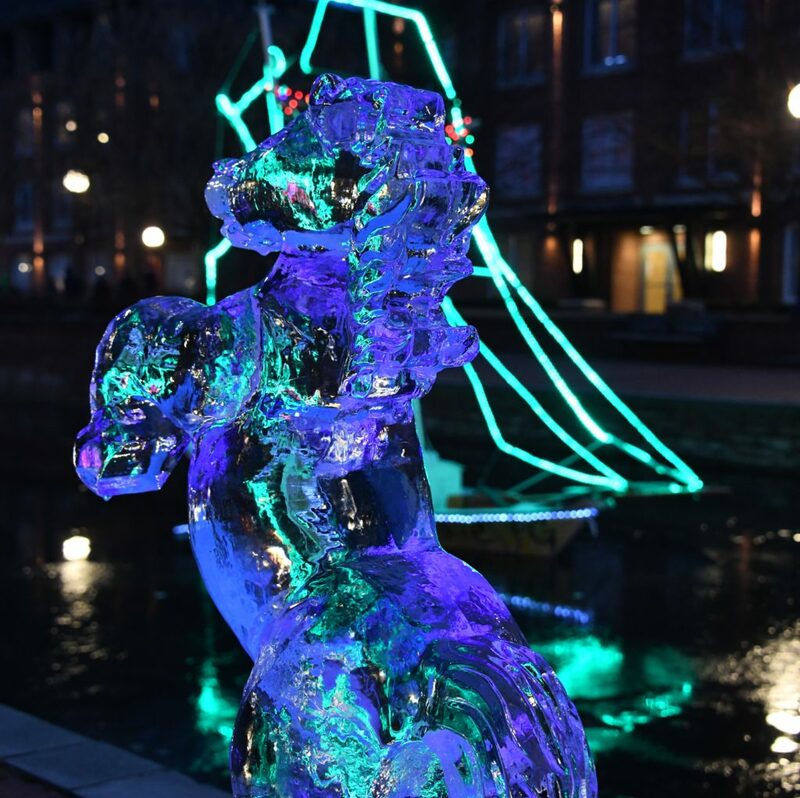 Ice sculptures will be on display beginning at 4PM, and will remain on display until 9PM. Each sponsoring business came up with their own unique design, so make sure you walk the entire loop to see every last design!! Find a complete list of sculpture locations here. 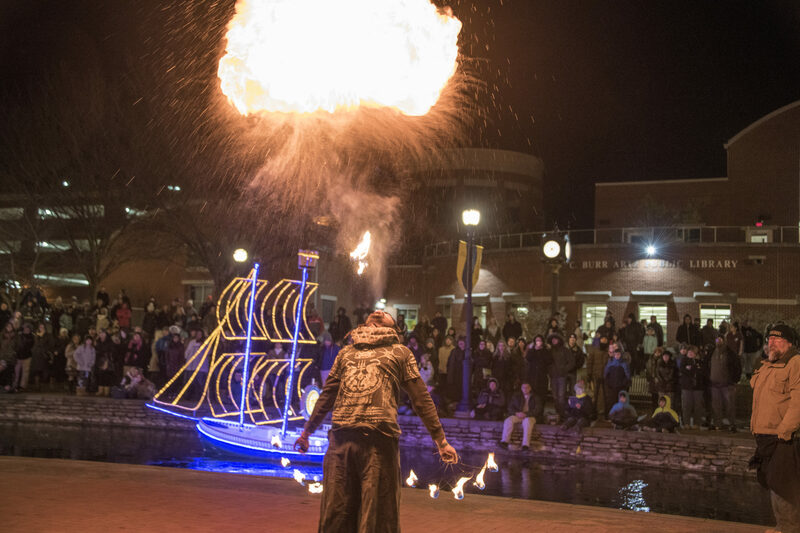 Pyrophoric takes the stage at 7PM to wow the crowds with fire performances in Carroll Creek Amphitheater. Make sure you get there early to claim a good viewing spot! These are just the basics, so make sure you check in on the February First Saturday event page for the most up-to-date information and follow Downtown Frederick Partnership on Facebook and Instagram for any day-of changes. Thank you to our sponsoring partners at Frederick County Bank, Plamondon Hospitality Partners and Elliott CPA LLC for making this incredible day possible!